A general view of the 9th Session of the General Conference Methodist Message picture by DANIEL LIE. 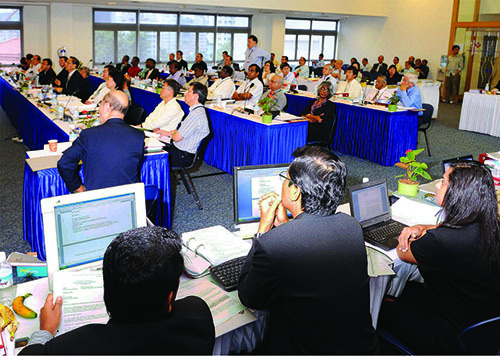 THE General Conference (GC) of The Methodist Church in Singapore has taken several significant decisions during the first part of its 9th Session from Sept 8 to 13, 2008. The GC – the highest policy-making body of the Church – approved the new Episcopal remuneration package, which will be implemented from the 9th Quadrennium onwards. A transport allowance based on the practice of the Annual Conference to which he belongs. The GC also endorsed the setting up of a Council of Governance for the policy-making body, the formation of a Board of Governance for each of the three Annual Conferences, and Church Governance Committees in the Local Churches. 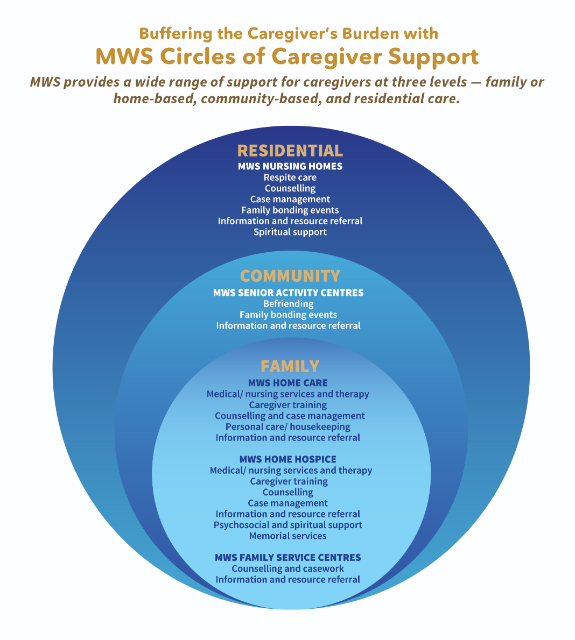 This is to comply with the requirements of the Code of Governance for Charities and Institutions of a Public Character (IPCs) issued by the Charity Council on Nov 26, 2007. The GC shall elect a chairman for the Council of Governance, and the Council shall have not less than two and not more than six lay persons who shall be the other members of the Council. Key office-bearers of the Church were elected in September before the 9th Session was adjourned to Dec 4 and 5 for a few remaining church business items and the election of a bishop. Mr Chan Fook Kay was elected as the new Finance and Administration Council (FAC) Chairman. Three other key positions filled were: The Secretary of the Trustees of The Methodist Church in Singapore – Mr Kim Seah Teck Kim – (re-elected); General Secretary – Mr Lim Soo Chin (re-elected); and Treasurer – Mr Chan Kum Kit (re-elected). The Methodist Missions Society has a new Chairman – Mr Chou Fang Soon – and so has DISCIPLE Agency – the Rev Dr Gregory Goh Nai Lat. All church members are urged to continue praying for the 9th Session of the General Conference, which will resume at Methodist Centre on Dec 4 and 5 at 9 am. 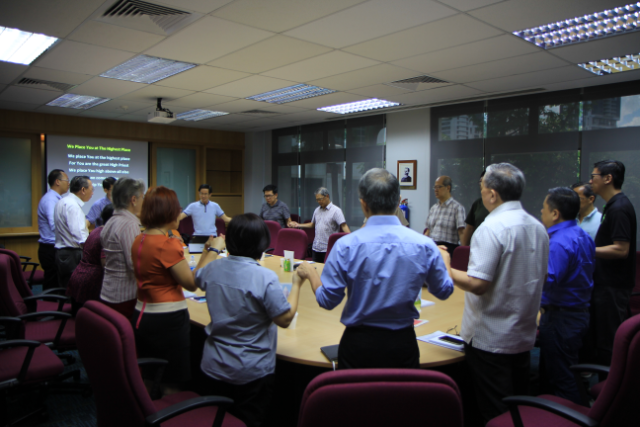 THE General Conference (GC) will have to look at the structure and the role of oversight and shepherding of the flock, and examine the directions The Methodist Church in Singapore (MCS) is taking. Stating this in his Episcopal Address on Sept 12, Bishop Dr Robert Solomon said the administrative role of the bishop is an area that is often a grey area. The episcopal role has biblical roots and has been fleshed out in history as the church encountered many challenges in its history, from severe persecution to serious divisions, to heretical and socio-cultural and moral corruptions. Being in episcopal office has given him a first-hand experience of the challenges, opportunities and travails of the role. The bishop’s role covers three main areas: the teaching office, the ceremonial/ liturgical role, and the administrative role. Bishop Dr Solomon said: “I have had the privilege to be in a liturgical and ceremonial role in having dedicated church buildings, and ordained clergy in Singapore and in our Missions in the region. I have also had the joy of baptising children and adults in some of our churches. But it is in the teaching role of the episcopal office that he has found greatest satisfaction. “I have had the joy of preaching and teaching in our churches, and of exercising the teaching office through writing and speaking at our various connectional gatherings. I have also attempted to live up to the vows I had taken, which include defending the faith and order of our church. “This quadrennium had its difficult moments and I want to thank those who had prayed for me and given encouragement to their bishop. A CONSECRATION or re-dedication service for the newly-elected Bishop of The Methodist Church in Singapore for the 9th quadrennium is scheduled for Dec 5, 2008 at Barker Road Methodist Church at 8 pm. This will be held after the election of the bishop and the closing of the 9th Session of the General Conference at the adjoining Methodist Centre. The Conference, which was not able to end all its business sessions from Sept 8 to 13, was adjourned to Dec 4 and 5 as originally planned. 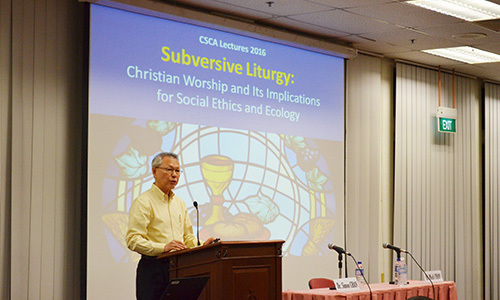 THE churches in Singapore continue to face many challenges and issues and the National Council of Churches of Singapore (NCCS) has grown in its national role and stature in more recent times. Bishop Dr Robert Solomon had the privilege of representing to government leaders and the public the concerns and positions of the Christian community in Singapore. He has been a member of the National Steering Committee on Racial and Religious Harmony chaired by the Minister for Community Development, Youth and Sports, Dr Vivian Balakrishnan. In his work as bishop, he has been involved in ecumenical partnerships and ministries. He has been closely involved in the work and witness of the Fellowship of Asian Methodist Bishops and has become more aware of the challenges and opportunities faced by Asian Methodists today.